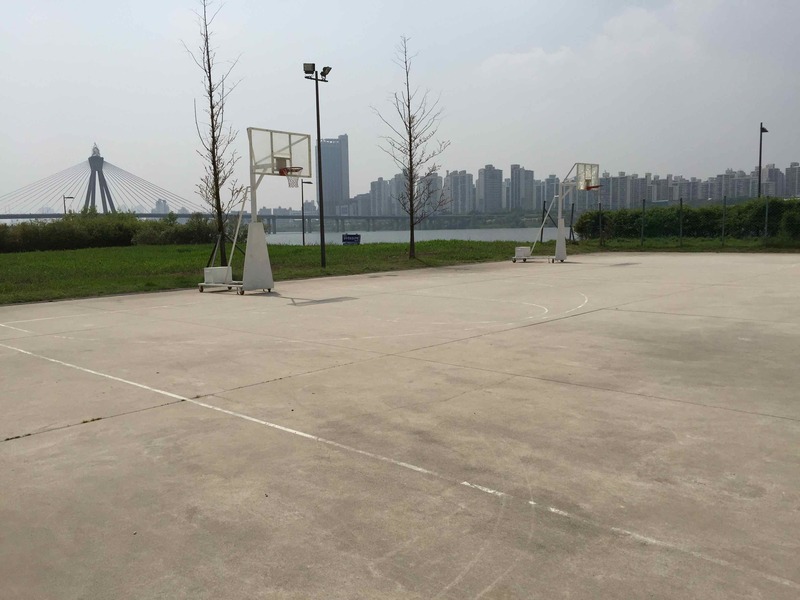 Gwangnaru Hangang Park is a good place to look if you are searching for a decent basketball court in eastern Seoul. 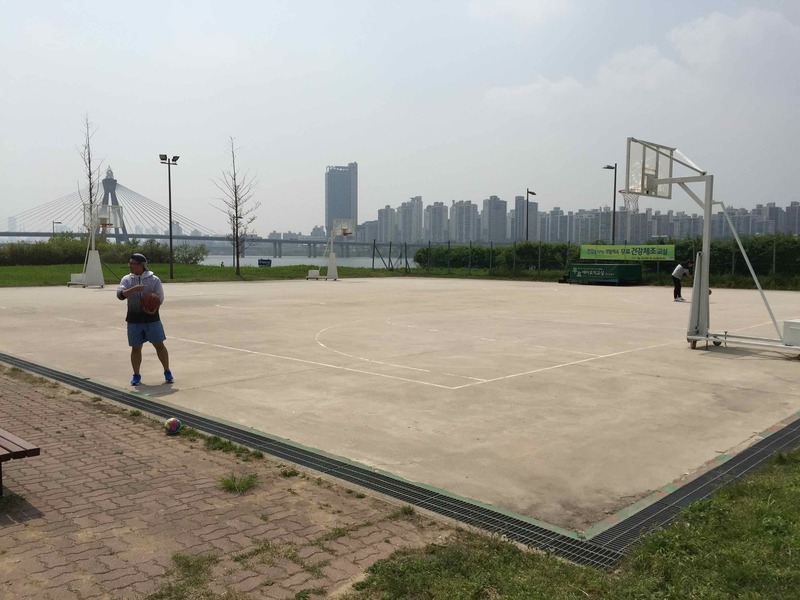 The courts are in good condition, and there is a rather nice view of the Han River to be had. 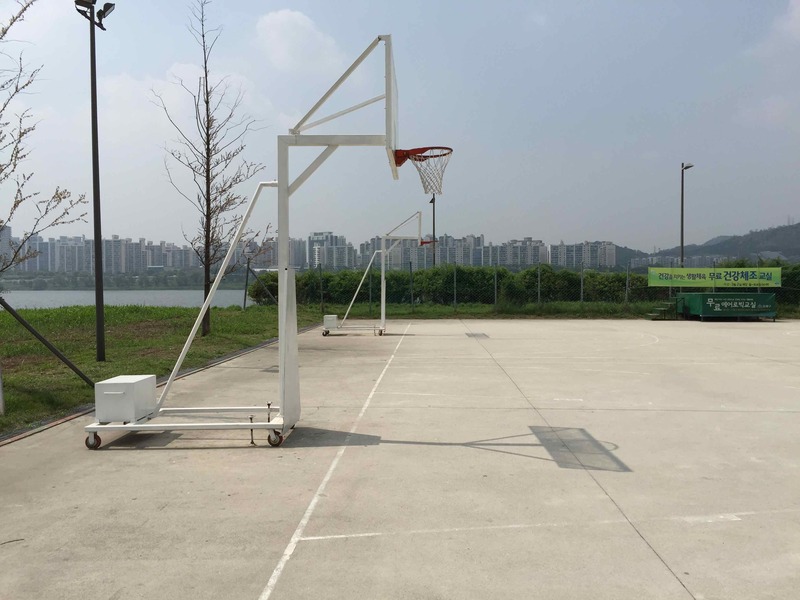 On the one hand, it's kind of nice that Gwangnaru Hangang Park's basketball courts are relatively isolated. Being isolated means fewer people to battle for time on the court. 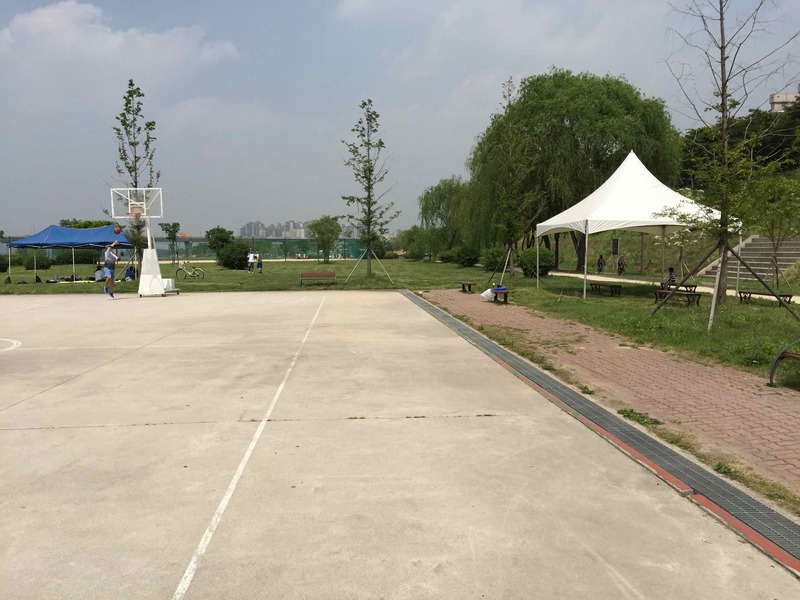 On the other hand, it's kind of a shame that Gwangnaru Hangang Park's basketball courts are relatively isolated. Being isolated means fewer people to battle on the court. The courts are definitely in good shape--as far as playground ball is concerned. 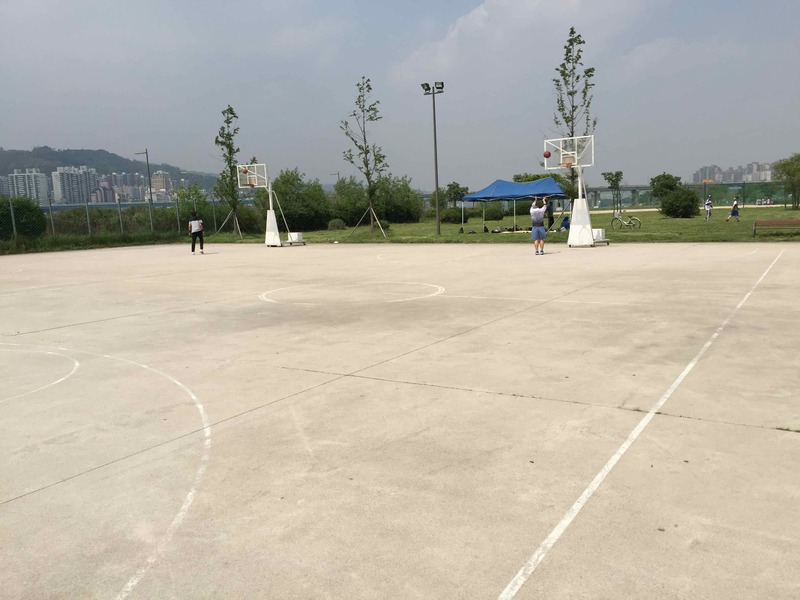 However, unless there is some particular reason dragging you out to these courts, there's probably no reason to make a trip to Gwangnaru Hangang Park's courts for the sole reason of playing ball. There are plenty of other good choices. The scnery is good. The Han River flows very nearby. The courts get used, but they are never too busy. There are two side-by-side courts. This is better than one court. The courts are difficult to get to for the average person on foot. The courts are a bit isolated from....well, from a lot of things. If you have to pee, use on of the nearby bushes. If you head here on a hot, summer day, be prepared. Not much shade is nearby. Consider sporting a headband and shades to relieve the messy face and glare. 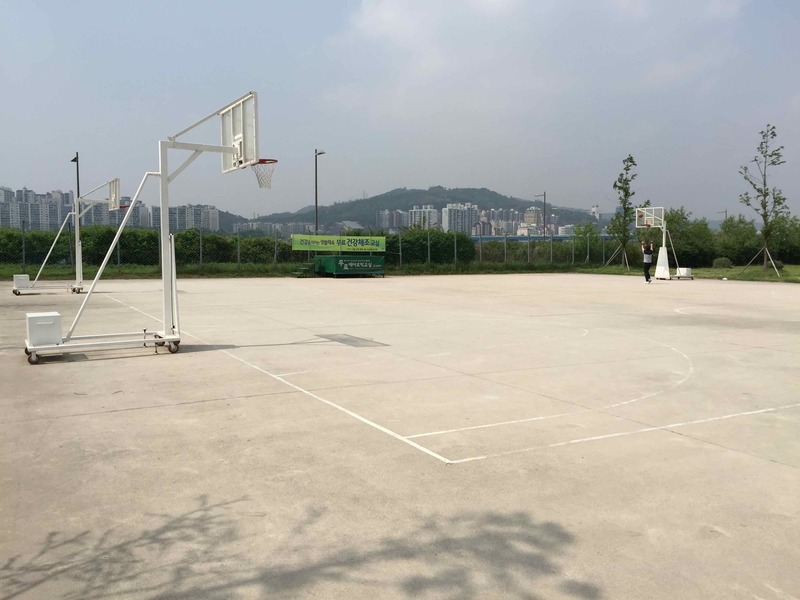 There is absolutely nothing fancy about this court's surface. It is a slab of gray concrete with slightly faded white boundary lines painted onto it. It is very much a 'playground' court. There isn't much shade near the courts. You'd better have a plan for how to stay cool. One option: jump into the Han River. Seriously, though, load up on drinks before heading to the courts. Be prepared. -Walk straight out of exit 10 and follow the sidewalk next to the main road. Stay on the sidewalk until you cross over a highway. -Look for stairs on the left and take them down to the park. Follow the river downstream (to the left) for about 10 minutes. The courts are in the middle of a small field. Want to contact The Seoul Stop? Have any suggestions? See any mistakes?